Fall will begin just as Summer ended-warm. A warm bubble of high pressure continues to sit over the Northeast. These above average temperatures will stick around through Friday. A significant cool front will arrive Saturday. It will be noticeable with readings at lest ten to fifteen degrees cooler. The Autumnal Equinox occurred today at 10:21am. This is the exact time the sun’s direct rays cross from North to South over the equator. There is just about equal day and night. Sunny and warm with readings in the mid 80s. Northeast to Southeast wind at 5-10mph. Mostly clear. Lows in the mid to upper 60s in the City, the lower 50s inland. Light & Variable Winds. Mostly sunny and seasonal. 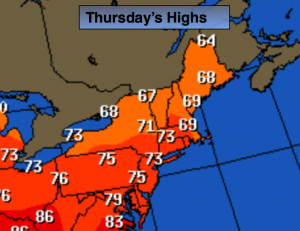 Highs in the lower to mid 70s. Mostly sunny and much cooler with readings around 70º. 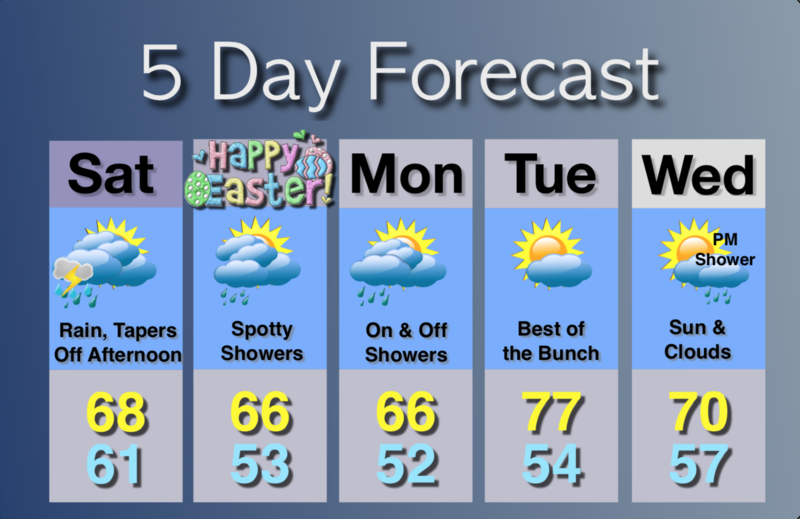 Mostly sunny with highs near 70º. Summer will go out fighting today as temperatures will be very warm. Fall arrives tomorrow at 10:21am. It won’t feel like fall as temperatures will remain in the 80s through the week with warm high pressure in control. A significant cool front will arrive by Saturday night. Partly sunny and warm with highs in the mid 80s. The humidity will be noticeably lower. Northeast wind at 5-10mph. Mostly clear. Lows in the mid to upper 60s in the City, near 50º inland. Light Northeast wind. Sunny and warm with readings in the lower to mid 80s. Sunny with highs in the lower to mid 80s. Mostly sunny and seasonal with highs in the mid 70s. Mostly sunny and much cooler with readings in the upper 60s. High pressure will work into the area today and remain in the Northeast through the start of Autumn on Thursday. It won’t feel like fall as temperatures will remain in the 80s through the week. A significant cool front will arrive by Saturday night. Clouds will give way to partly sunny skies with highs in the lower to mid 80s. Northeast to East wind at 5-10mph. Mostly clear. Lows in the mid to upper 60s in the City, the 50s inland. Light and variable winds. Sunny with highs in the lower 80s. Partly sunny with highs in the lower to mid 80s. Partly sunny in the upper 70s. A trough in the upper levels of the atmosphere will pivot through the area today. At the same time a deep tropical moisture laden airmass will be in the place. The combination of the two will cause a period of heavier and steadier rain this morning, not all areas will receive heavy rain. Where the heavy rain axis sets up an inch or more of rainfall is possible. The last time over a half inch of rain fell, and this occurred only for a few areas, was around the August 20th date. The last widespread heavy rain event that included the entire area was the last two days of July! There should be a break in the action during the afternoon, especially over the Western half of the tri-state. By later in the day stray storms are possible. The system will swing off the coast as high pressure works in for the remaining days of Summer. Autumn arrives on Thursday. The drought situation continues to worsen. 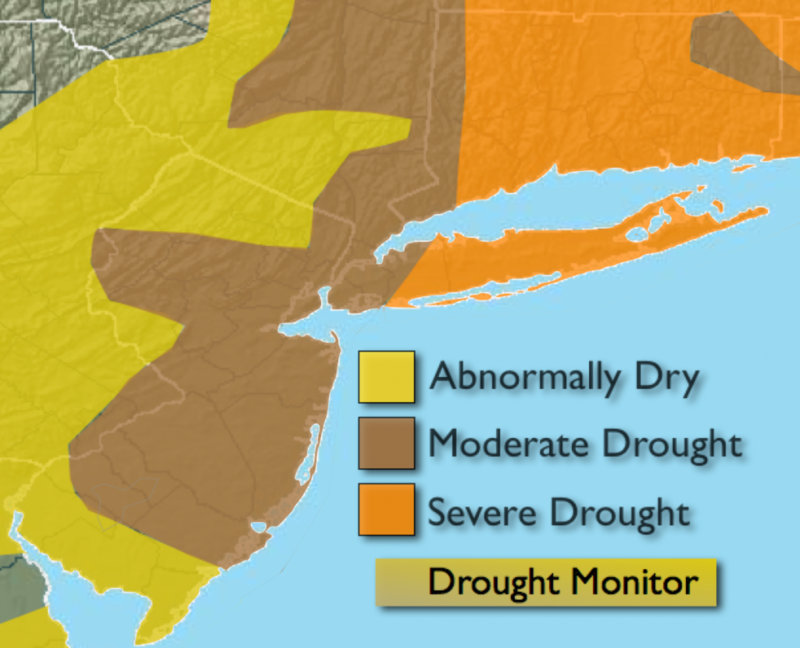 Most areas are in a moderate to severe drought. The rainfall deficit for the year ranges from five to ten inches, with the highest deficit being over Long Island and parts of Connecticut. If the heavy rain materializes it would help the immediate dry conditions but it won’t alleviate the drought conditions. I guess every bit helps. A period of heavy rain and scattered thunderstorms are possible in the morning, otherwise mostly cloudy and humid with stray afternoon showers. Highs in the upper 70s. South to Northeast winds at 5-10mph. Cloudy and muggy with scattered showers. Lows near 70º in the City, near 60º inland. Light and variable winds. 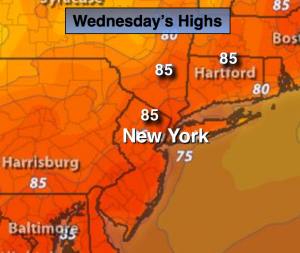 Sunny with highs around 80º. Partly sunny with highs in the lower 80s. A moisture laden Southerly flow ahead of an upper level trough with produce scattered showers today, mainly in the afternoon- much of the time it will be dry. It’ll be humid. The trough will pivot through the area Monday morning. At this time a period of heavier and steadier rain is possible. The first map above shows possible rainfall amounts by Monday night. Most areas are expected to receive over an inch of rain. This maybe overdone but it would be welcomed. The last time over a half inch of rain fell, and this occurred only for a few areas, was around the August 20th date. The last widespread heavy rain event that included the entire area was the last two days of July! There should be a break in the action during the day Monday. By late afternoon spotty storms are possible. The system will swing off the coast as high pressure works in for the remaining days of Summer. Autumn arrives on Thursday. The drought situation continues to worsen. Most areas are in a moderate to severe drought. The rainfall deficit for the year ranges from five to ten inches, with the highest deficit being over Long Island and parts of Connecticut. The rain won’t put a dent in the dry conditions, but I guess every bit helps. Mostly cloudy with spotty showers, mainly in the afternoon. Highs will be near 80º. South wind 10-15mph. Cloudy and muggy with scattered showers. A period of steady and heavier rain is possible in the wee hours of the morning. Lows near 70º in the City, mid 60s inland. South wind at 5mph. A period of heavy rain is possible in the morning, otherwise mostly cloudy and humid with scattered afternoon showers, more likely during the afternoon. Highs in the upper 70s. Partly sunny. 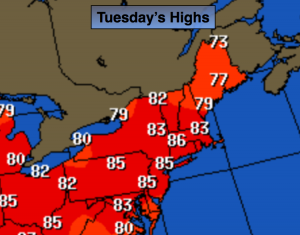 Highs around 80º. Sunny and warm with readings in the lower 80s. High pressure will lose it’s influence over the region this weekend-this last weekend of Summer, Fall arrives on Thursday. We’ll squeeze out one more beauty today. By Sunday a moisture laden Southerly flow ahead of a weakening cool front will produce scattered showers, mainly in the afternoon. The showers won’t be widespread so it won’t be raining all the time. 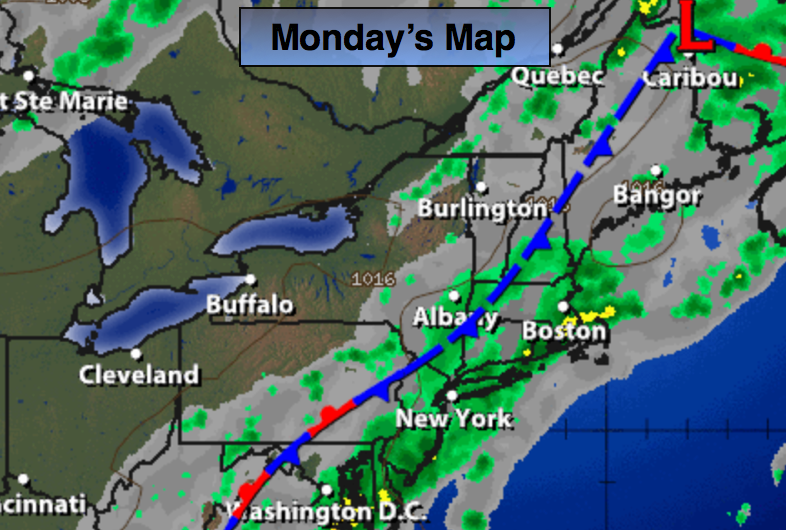 The front will slow down on Monday continuing the threat of showers and possibly a thunderstorm. The drought situation continues to worsen. Most areas are in a moderate to severe drought. The rainfall deficit for the year ranges from five to ten inches, with the highest deficit being over Long Island and parts of Connecticut. Mostly sunny. Highs will be in the mid to upper 70s. Southeast wind 10-15mph. Becoming mostly cloudy. Not as cool as recent nights. Lows in the upper 60s in the City, mid 60s inland. Southwest wind at 5mph. Mostly cloudy, more humid. Scattered showers, more likely during the afternoon. Highs in the upper 70s. 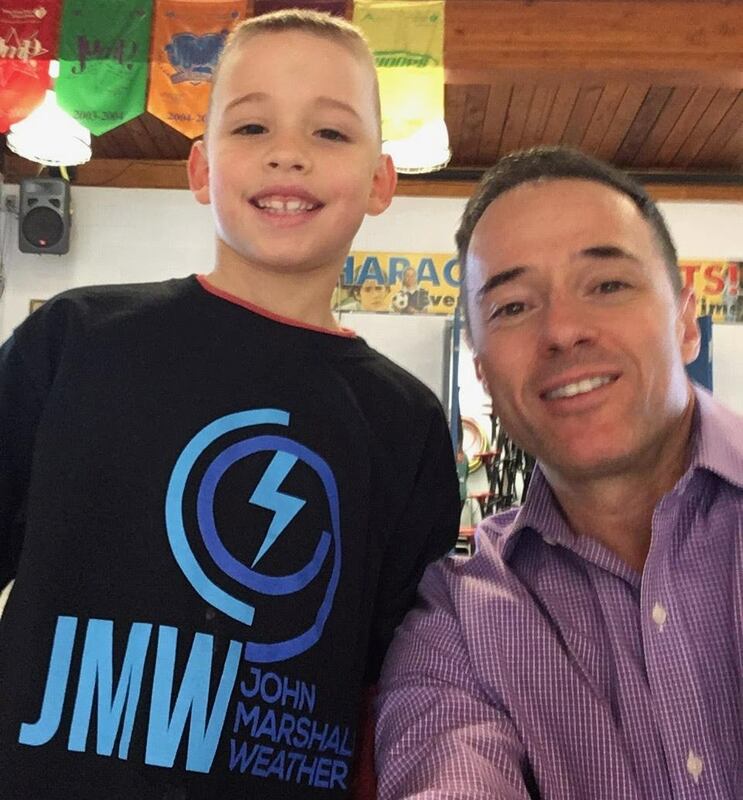 Mostly cloudy with a chance of showers and thunderstorms. Highs in the upper 70s. Strong Canadian high pressure will influence our weather into the first part of the weekend. Pleasant conditions are expected through Saturday. The next chance of showers won’t come until Sunday with an approaching cool front. These high pressure systems are precluding storm development which is worsening the drought situation. Most areas are in a moderate to severe drought. The rainfall deficit for the year ranges from five to ten inches, with the highest deficit being over Long Island and parts of Connecticut. Sunny with seasonal readings. Highs will be in the mid to upper 70s. Southeast wind 8-12mph. Clear and cool with lows in the lower 60s in the City, the upper 40s inland. Southeast wind at 5mph. Mostly sunny with highs in the upper 70s. Mostly cloudy with a chance of showers. Highs in the upper 70s. Possible morning showers, afternoon sun. Highs in the upper 70s. Mostly sunny with highs in the lower 80s. A strong Canadian will move toward the Northeast today. 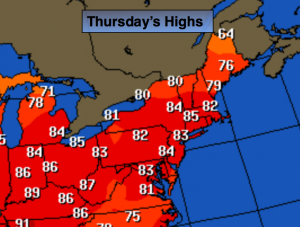 It’ll be a Fall preview for the end of the week especially after Wednesday’s high of 91º. Pleasant conditions are expected through Saturday. The next chance of showers won’t come until Sunday afternoon with an approaching cool front. These high pressure systems are precluding storm development which is worsening the drought situation. The forecast doesn’t look good for significant/widespread rain the next several days. An updated drought statement will be issued in the coming days. Sunny and much cooler. Temperatures will be in the mid 70s. Northeast to East wind at 8-12mph. Clear and very cool with lows near 60º in the City, the mid to upper 40s inland. Southeast wind at 5mph. Sunny with seasonal readings. Highs will be in the mid to upper 70s. Morning sun will give way to clouds and afternoon showers. 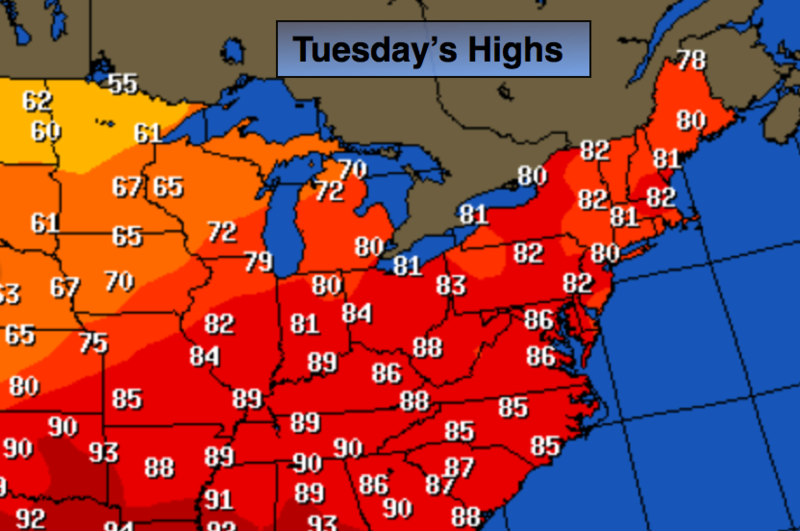 Highs around 80º. High pressure will continue to dominate our weather through today. It’ll warm up, but cool air will once again invade the region with a cool front sweeping in tonight. Another strong high pressure system will move in for late week making it feel more like Fall. Mostly sunny, warmer with highs in the mid to upper 80s. A stray late day storm is possible. Most areas will be storm-free. Southwest to West wind at 10-20mph. Mostly clear and cool Lows in the lower 60s in the City, the lower 50s inland. North wind at 10-20mph. Sunny and much cooler. Temperatures will be in the mid 70s. Strong high pressure will continue to dominate our weather through Wednesday. This will result in pleasant readings. Nights will be crisp-fall like. It’ll warm up for Wednesday but the cool air will once again invade the area by weeks end with another Canadian high pressure system moving in. These high pressure systems are precluding storm development which is worsening the drought situation. The forecast doesn’t look good for significant/widespread rain the next several days. An updated drought statement will be issued in the coming days. Sunny. Highs in the lower 80s. Southwest to South wind at 10-15mph. Clear and cool Lows in the upper in the City, the upper 50s inland. Southwest wind 5mph. Partly sunny, warmer with highs in the mid to upper 80s. 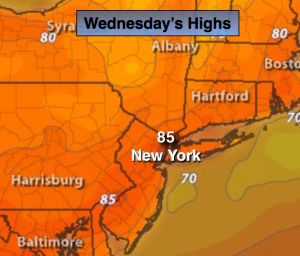 Mostly sunny with highs near 80º.